>>> good evening tonight. in the midst of a massive humanitarian crisis in japan and fears of radiation on both sides of the pacific ocean , for much of the day there's been a disagreement between the americans and the japanese over how dangerous the nuclear crisis is and how much radiation is being released into the environment. here's the very latest on the japan disaster. the humanitarian crisis continues. over 4100 confirmed dead . there are 12,000 unaccounted for. 100 countries have now offered aid to japan . tens of thousands of people have been scanned for radiation. american citizens within 50 miles of the bad reactors have been told to evacuate or stay inside their homes after the most recent spike in radiation was measured in the air. and there are new concerns tonight about two possible breaches in the containment vessel. nbc's lester holt begins our coverage of all of it. he's in tokyo tonight. lester, good evening. >> reporter: brian, good evening. the failures are happening on so many levels it's hard to predict where all this is going. the latest crisis within a crisis involves reactor number 4 and spent fuel rods that may now be lying in a dry cooling pond allowing them to continue to heat. some experts say they could melt and release even more radiation. >> we do not know if it's caused by the flame or if it's a hydrogen explosion. >> reporter: fear and confusion across japan today as smoke and steam continue to billow from the stricken nuclear plant . these new satellite photos give us the clearest view yet of the destruction to the site. there are concerns tonight about a possible breach in the containment vessel at reactor 3. a confirmed breach in reactor 2 is already leaking radiation. and there are new fears that the all-important water cooling the still highly radioactive spent fuel rods at reactor 4 is dangerously low. workers were temporarily evacuated during the night and a water drop by helicopter was aborted after radiation levels briefly surged. tonight officials say they will be running a new power line to the plant that could restore power to the crippled cooling system, potentially a big step forward. but the public no longer knows what to believe. 77-year-old emperor akihito made a rare tv address. [ speaking foreign language ] i am deeply concerned about the nuclear situation because it is so unpredictable, he said. these enormous lines in sendai are people waiting for one bus out of town. near the plant, getting checked for radiation levels now the norm. >> people are worried because we don't really understand radioactivity. you have to give faith in the scientists that study this kind of thing. >> is that a good thing or bad thing? >> that's a bad thing. >> reporter: contain slightly elevated amounts of radiation, but of no danger to us. in tokyo we found stores running out of everything, a sign of growing anxieties. >> nothing. no water, no food, so i'm going back to my hometown. >> reporter: other parts of this normally bustling city looked like a ghost town . fear and a shortage of gas are keeping people off the streets. back in the disaster zone, snow and cold today hampering rescue efforts, but hope has not been abandoned. >> if you can hear me, make a noise. >> reporter: u.k. rescue teams search a home after family members believe they hear a voice. >> the chance of survival are small but we'll do our best to see if we can get anybody in there. >> reporter: after dogs and teams go in, only a body comes out. as time goes by, chances only grow dimmer, as the effects of this earthquake, tsunami and now growing nuclear crisis continue. and with regard to that nuclear crisis, officials are using everything in their toolbox, including reportedly water cannons they may use to refill those dry cooling pools in reactor number 4 . they may also try again with helicopters to drop water on the crippled reactors, brian. >> lester holt heading up our coverage out of tokyo tonight. lester, thank you. 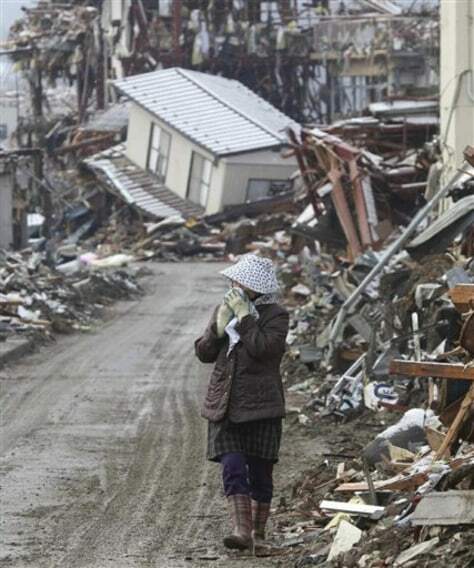 A woman walks through debris looking for household belongings in Rikuzentakata, northern Japan Wednesday.